Two versions of the dark murder mystery, THE 13th CHAIR. Tod Browning directs the 1929 version which stars Bela Lugosi and the 1937 version features Lewis Stone as the detective. A weird medium, a murder and a house of suspects create the backdrop for this tale of mystery. Stars Gene Barry and Valerie French. An other-worlding civilation visits eath. Bringing with them the seeds of total destruction. n the hands of humans, how will mankind survive? Thought-provoking serious and scary sci-fi! Treasury Agents (T-Men) get down and dirty as they they uncover a brutal counterfeiting gang in the underbelly of society. CLICK IMAGE FOR DETAILS. Based on the cartoon strip by Hal Forrest, this thrilling serial faithfully re-creates all of the exciting characterizations and non-stop action followed by millions in the daily comics. Tommy Tompkins is a youthful auto mechanic recruited to fly for the Three Points Airlines. Tailspin Tommy is back in a second explosive serial filled with non-stop action, nail-biting suspense, thrilling stunts, and unbelievable special effects. Tommy and Skeeter try to foil an unscrupulous plan. I can remember always being entertained by this TV anthology show from a few decades back. A low budget show that rose above....similar to the great Amicus movie anthologies. 533 minutes! CLICK IMAGE FOR DETAILS. Shot in black and white and utilizing many locations and character names from the classic Universals this is a throwback film from Joe DeMuro. Vampires, a wolf man and a Frankenstein Monster all are back, thanks to make-up master Ron Chamberlain (in the tradition of Jack Pierce). Anton Diffring plays Dr. Frankenstein. The Frankenstein monster, played by Don Megowan, is in Karloff-styled classic make-up. A joint venture between Universal and Hammer studios. This Image All-Day version of this rare TV pilot. Best quality. Plus, loads of Frankenstein film trailers. TALES OF FRANKENSTEIN (1966 TV)/THE TERROR (1963) - Double Feature DVD. CLICK IMAGE FOR DETAILS. A British television mini-series hosted by Christopher Lee and featuring storise based on the works of Edgar Allan Poe. CLICK IMAGE FOR DETAILS. A 10-pack of movies in a box set. 5 DVDs, with a movie on each side. CLICK IMAGE FOR TITLES AND DETAILS. Three stories of Poe brought to the screen by Vincent Price, Peter Lorre and Basil Rathbone. Price is in all three episodes. The last one with Basil Rathbone is the best (CASE OF M. VALDIMIR); watch Vincent Price melt like the Wicked Witch of the West! Three Vincent Price classics: TALES OF TERROR (1962), THE PIT AND THE PENDULUM (1961) and THE RAVEN (1963). Co-stars include Boris Karloff, Peter Lorre, Basil Rathbone and Barbara Steele. Lightweight cardboard packaging. Two films and a cartoon! ATOM AGE VAMPIRE and REVOLT OF THE ZOMBIES. Bonus cartoon: A HAUNTING WE WILL GO. Stars Donald Pleasance, Jack Hawkins and Joan Collins. An Amicus horror anthology that is set in a modern asylum. The chief doctor describes the horrible nature of four patients and their stories. Supernatural beings, weird trees, materialization and one nasty cook-out! Stars Syd Saylor, Gene Morgan, Doris Hill, and Glen Tryon. Directed by Frank Strayer (THE MONSTER WALKS). A povery-row productuion from the thirties. CLICK IMAGE FOR DETAILS. John Agar and Leo G. Carroll star in a great 50's sci-fi! Mutations and a whopper-size arachnid. Stars James Pierce, Frederick Peters, Edna Murphy and Boris Karloff. A hunt for a city of rare diamonds leads to danger and Tarzan comes to the explorers aid. CLICK IMAGE FOR DETAILS. Stars Bruce Bennett. An ancient idol deep in the jungles of Guatemala holds the mysterious means for mass destruction. Tarzan is enlisted by the government to find this secret power. Compiled from a partially lost serial, this is a very rare Tarzan film epic. Click image for more details. Tarzan in a James Bond setting with sci-fi gadgets! One of the most crazy Tarzan movies ever with Don Megowan (CREATURE WALKS AMONG US) as a giant thug that scraps with the ape man. A young boy is kidnapped and Tarzan will stop at nothing to save him. Exploding wrist watches and nutty gadgets! DVD from AMC Movies. Two feature films: TARZAN THE FEARLESS (1933) starring Buster Crabbe and TARZAN'S REVENGE (1938) starring Glenn Morris. Stars Elmo Lincoln, Enid Markey and some guys in ape suits. A historic 1918 version of the classic Edgar Rice Burroughs story of an infant raised by apes in darkest Africa. Bonus: behind-the-scenes of a Gordon Scott film. TARZAN THE FEARLESS (1933)/TARZAN AND THE TRAPPERS (1958) - Double Feature. CLICK IMAGE FOR DETAILS. 15 chapter serial based in Edgar Rice Burrough's TARZAN AND THE JEWEL OF OPAR. Stars Frank Merrill as the King of the Jungle. Silent with sound effects. 266 minutes. Lex Barker stars as Tarzan, Brenda Joyce as Jane in this magical fantasy from 1948. A secret jungle location is home to the real Fountain of Youth, preserving of young woman's beauty for years beyond her time. A group of outsiders hit the jungle to find this alchemy. Also stars Evelyn Ankers. Directed and documented by Cleveburg Productions. Fans having fun with vampires at Monster Bash 2011. See the intrepid Tom and Uncle Ira face a horror right out of Hammer Films. This DVD includes some in-depth interviews with Monster Bash Guests of Honor - click image for details. TEENAGE CAVEMAN (1958)/THE VIKING WOMEN VS. THE SEA SERPENT (1961). CLICK IMAGE FOR DETAILS. Also known as METEOR MONSTER. Subject to strange rays from a comet, a teenager turns into hideous monster. Not good for small town America. Cast includes Anne Gwynne, Stuart Wade and Gloria Castillo. Make-up by Jack (FRANKENSTEIN) Pierce! TEENAGE MONSTER/TEENAGERS FROM OUTER SPACE - Double Movie Pack. CLICK IMAGE FOR DETAILS. Stars Katherine Victor (WILD WORLD OF BATWOMAN). Teenagers out water-skiing happen on a mysterious island. CLICK IMAGE FOR DETAILS. Giant lobsters may invade planet earth...will teenagers from outer space save us? Best scene: dog blasted by alien ray-gun....turns immediately to bones and falls over. Outrageous Daddy-O! Giant lobsters may invade planet earth...will teenagers from outer space save us? You'll never forget the blast from a ray gun that turns the neighborhoods dog into a skeleton! Outrageous Daddy-O! Stars Lon Chaney. Chaney as a tough Marine who probably chews nails for breakfast. A new recruit that is of questionable morals and without responsibility finds the going tough due to Chaney. Surprisingly touching with great performances. THE TELL-TALE HEART (1960)/CHILLER (1985) - Double Feature DVD. CLICK IMAGE FOR DETAILS. TEN NIGHTS OF TERROR (10 Movie Set). Karloff, Lugosi, Chaney Jr. and Carradine all appear on this set! Ten movies on 5 double-sided discs. CLICK IMAGE FOR TITLES AND DETAILS. At an underater city, weird experiments are taking place in the ocean labs. Humanoid creatures are being developed...perhaps for surface conquest? CLICK IMAGE FOR DETAILS. Basil Rathbone and Nigel Bruce as Holmes and Watson. A precious stone is stolen on a train and Holmes begins to flesh it out. Basil Rathbone and Nigel Bruce as Holmes and Watson. A precious stone is stolen on a train and Holmes discovers a mysterious coffin on the baggage car! CLOCK IMAGE FOR DETAILS. Basil Rathbone and Nigel Bruce as Holmes and Watson. A precious stone is stolen on a train and Holmes begins to flesh it out. Includes restored black and white version and newly colorized version! A history of terror films through the decades, hosted by Donald Pleasence and Nancy Allen. A roller coaster ride of film screams from THE BRIDE OF FRANKENSTEIN to PSYCHO to THE EXORCIST and much more. Clips and famous scenes from the greatest scares of the silver screen. TERROR IN THE THE CRYPT (1963) Christopher Lee stars in a re-telling of the classic vampire story Carmilla. Atmospheric and chilling. SLAUGHTER OF THE VAMPIRES (1961)Moody, well-made Italian vampire flick. A female vampire, fangs bared, is pitch-forked to death by angry villagers. A really cool looking giant hairy beast is found stomping around a snowy mountain region. The monster terrorizes people in a cabin...great miniatures and effects. Also known as: INVASION OF THE ANIMAL PEOPLE. Really excellent horror thriller with Frances Lederer as a Dr. Moreau-type. It is kinda a cross between ISLE OF LOST SOULS and MOST DANGEROUS GAME. CLICK IMAGE FOR DETAILS. Really excellent horror thriller with Frances Lederer as a Dr. Moreau-type. It is kinda a cross between ISLE OF LOST SOULS and MOST DANGEROUS GAME. Really excellent acting and story....pretty shocking for 1959 with a horrifying panther-man-monster. Also known as: BLOOD CREATURE. By the book adaptation of Mary Shelley's "Frankenstein." Made by the producer/director of IN SEARCH OF DRACULA. An Irish/Swedish co-production of a man who makes a monster...and regrets it ever more. Christopher Lee stars in a re-telling of the classic vampire story Carmilla. Atmospheric and chilling. THis edition hosted by "Morella" - the ghost hostess. Bonus serial chapter from Bela Lugosi's THE PHANTOM CREEPS. Very cool British old dark house flick. Moves much faster than most of its kind. A hooded, dark figure terrorizes people on --- you guessed it! --- a dark and stormy night. CLICK IMAGE FOR DETAILS. Karloff in a Corman quickie that's really very good. The ghost of a dead woman romances a soldier. A young Jack Nicholson co-stars. Remastered. Finally a great print fom 35mm! 2 discs: a Blu Ray and DVD. Boris Karloff in a Corman quickie that's really very good. The ghost of a dead woman romances a soldier. A young Jack Nicholson co-stars. THE TERROR (1963)/A BUCKET OF BLOOD (1959) - Double Feature. CLICK IMAGE FOR DETAILS. THE TERROR (1963)/REVOLT OF THE ZOMBIES (1936) - Double Feature. CLICK IMAGE FOR DETAILS. It's a hidden treasure in the jungle and our cast faces a giant gorilla, Tiger Men and more thrills from Saturday afternoons of long ago. Over four hours of fun! All 15 serial chapters. CLICK IMAGE FOR DETAILS. The remake of Fritz Lang's THE CRIMES oF DR. MABUSE. The master criminal returns to terrorize a nation. This DVD also includes the 1932 Frit Lang film THE CRIMES OF DR. MABUSE. CLICK IMAGE FOR DETAILS. One of the oldest known amateur adaptations of an H.P. Lovecraft story. The strange story of the demise of two young students, a forgotten graveyard and the cosmic horror deep below! Shot in the summer of 1987 with a home VHS tape deck. Sanity-blasting! Stars Leo Gorcey, Bobby Jordan and Sammy Morrison. One of the Muggs wants to be a racing jockey at any cost, no matter who he runs over. Bobby and the boys try to help him see the light before it's too late. A Vincent Price Scream Legend double feature: THEATER OF BLOOD (1973) The actor (Vincent Price) scorned by critics, plots his revenge. Better think twice before trashing Vincent Price! MADHOUSE (1974) Price's is Dr. Death (a skull faced Phantom-like cloaked murderer). Real character or actor? Vincent Price double feature! FROM A WHISPER TO A SCREAM (1986) is one of Price's last horror films. THEATRE OF BLOOD (1973) has price as an actor wronged by critics and he's out for revenge in the most bizarre ways. Four of the coolest sci-fi flicks from the fabulous fifties! In this set: THEM! (1954), THE BEAST FROM 20,000 FATHOMS (1953), WORLD WITHOUT END (1959), and SATELLITE IN THE SKY (1958). Stars Robert Hutton, JenniferJayne, Zia Mohyeddin ad Michael Gough. Stranded aliens find themselves in a small farming town. They need workers to help them repair they spaceship. CLICK IMAGE FOR DETAILS. Stars John Garfield and the Dead End Kids. A dishonest fighter (John Garfield) is set-up by associates as the murderer of a newspaper man. CLICK IMAGE FOR DETAILS. The epic fantasy with Douglas Fairbanks Sr. Set design by William Cameron Menzies. Flying carpets, a wild dragon sequence and giant idols. CLICK IMAGE FOR DETAILS. The epic fantasy with Douglas Fairbanks Sr. Set design by William Cameron Menzies. Flying carpets, a wild dragon sequence and giant idols. Action packed adventure...154 minutes! Includes rare special effects footage, 19 minutes of rare outtake, introduced by Orson Welles. Newly re-mastered. Stars Rosey Grier and Ray Milland. Racist Ray Milland's head is transplanted onto Rosey Grier's body. Not-to-be-taken-seriously drive-in fun for....well, some of the family! Ha. Samuel Arkoff's crazy production. Original theatrical trailer included. Stars Rosey Grier and Ray Milland. Racist Ray Milland's head is transplanted onto Rosey Grier's body. Not-to-be-taken-seriously drive-in fun for....well, some of the family! Ha. Samuel Arkoff's crazy production. Stars Kenneth Tobey, Margaret Sheridan and James Arness. A military crew and a doctor head to investigate a downed UFO buried in ice. They retrieve an alien in a block of ice. CLICK IMAGE FORE MORE. The memorable anti-war sci-fi. Raymond Massey stars in this British Production with stunning visuals. Colorized and Black and White versions. The memorable anti-war sci-fi. Raymond Massey stars in this British Production with stunning visuals. This Criterion version features a high-definition restoration. Plus, an audio piece from H.G. Wells discussing the plague from his original writings. A William Castle special. Castle directs another chiller full of sensationalism. 13 ghosts are haunting a house and reveal themselves to a young boy who has just moved in. Special featurette included on the making of Illusion-O. Thirteen women who had gone to school together have their fortunes read. Their destines seem to be controlled mystically by Myra Loy who was cast out and shamed by these women when she was younger. A strange, eerie tale of revenge and twisted fate with supernatural overtones. Also known as: LADY BEWARE. Thirteen years after the reading of a will in a strange ritual, a young woman returns to the site. The house has been vacant and is now full of cobwebs. CLICK IMAGE FOR MORE. Stars Weldon Heyburn and Inez Courtney. The district attorney is silenced...the hard way. Dead. The murder is investigated by police in a Monogram Pictures mystery thriller. For all fans of those 1930s crime who-done-its! Thriller that involves a man persued by dangerous spies and assasins through London. An Alfred Hitchcock nail-biter! Stars Lou Costello, Dorothy Provine and Gale Gordon. Part-time inventor Costello accidentally happens onto a device that turns his girlfriend 30 feet tall. Then he has to try to keep the armed forces from blowing her to bits. Bud Abbott is missed in this one. A nuclear attack is under way and the United States is the target. A small group of people struggle through a night of terror as people's basic instincts run amok. CLICK IMAGE FOR MORE. A colorful space opera with Metaluna Mutants and alien landscapes. Faith Domergue stars in this true sci-fi classic! Stars John Wayne, Lon Chaney Jr., Raymond Hatton and Noah Berry Jr. A play off of the classic Three Musketeers with three members of the Foreign Legion fighting for their lives against an evil emperor in the Sahara Desert. 12 Chapter Cliffhanger! Those great matinee Stooge movies: HAVE ROCKET WILL TRAVEL, THE OUTLAWS IS COMING, AROUND THE WORLD IN A DAZE and 3 STOOGES MEET HERCULES. Plus two classic films from the 1940s: ROCKIN' IN THE ROCKIS and TIME OUT FOR RHYTHM! Great, fun set! A box set of three DVDs packed with vintage Three Stooge shorts. Many of the spooky ones are on thos collection: SPOOK LOUDER, MUMMY'S DUMMIES, SHIVERING SHERLOCKS, THE GHOST TALKS, HOKUS POKUS, FRIGHT NIGHT and many more. The chronilogical collection featuring prime Moe, Larry and Curly....CLICK IMAGE FOR DETAILS and EPISODES. Hours of Stooge mania! CLICK IMAGE FOR DETAILS. Hours and hours of Moe, Larry, and Curly. This volume includes a lot of spooky shorts, like IDLE ROOMERS with a werewolf! CLICK IMAGE FOR DETAILS. 24 Stooge filled shorts. Moe, Larry, and Curly for the first bunch, then Shemp in for Curly for the rest. 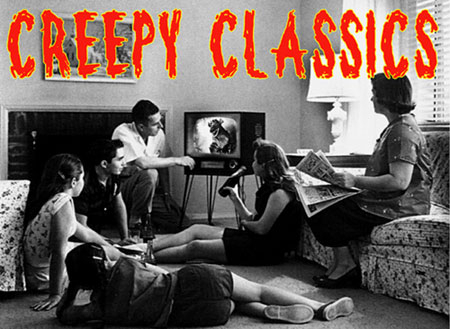 Classic episodes include: Mummies Dummies, Fright Night, 3 Little Pirates, Shivering Sherlocks, and more! The Stooges are rocking with the best of Shemp (and of course Moe and Larry)! In this set THE GHOST TALKS, WHO DONE IT (My favorite all time spooky Stooge short), and way more. CLICK IMAGE FOR DETAILS. This era left us with such classics as the Stooges' first 3-D shorts, SPOOKS! (in 3-D or flat on this DVD! ), PARDON MY BACKFIRE and Larry's hilarious spoof of Brando in CUCKOO ON A CHOO CHOO. CLICK IMAGE FOR DETAILS. These 32 digitally remastered shorts from 1955-1959 were made at the tail end of studios making "short features" for theatres. They include Moe, Larry, and Shemp on the first disc. Then on the second and thirds disc, Joe Besser joins them as they "third stooge." The Three Stooges are evited from their apartment and stumble upon a mad scientist in a spooky old house. Here they discover the scientist's rocket experiment and Martians! CLICK IMAGE FOR MORE. The Three Stooges assist their friendy neighborhood inventor travel back in time uses his new invention. It the time of Hercules and the Stooges are loose. CLICK IMAGE FOR MORE. Five classic Stooge shorts that include: BOOBY DUPES, CRASH GOES THE HASH, DUTIFUL BUT DUMB, HOW HIGH IS UP? and THREE MISSINF LINKS. It's Moe, Larry and Curly at their finest! Six Stooge films with Curly: A PLUMBING WE WILL GO, MEN IN BLACK, MICRO-PHONIES, PUNCH DRUNKS, THREE LITTLE PIGSKINS, and WOMAN HATERS. A Saturday matinee DVD packed with fun. Moe, Larry, and Curly! Six scary Stooge shorts that include: SPOOK LOUDER, MUMMY'S DUMMIES, SHIVERING SHERLOCKS, THE GHOST TALKS, HOKUS POKUS and FRIGHT NIGHT. It's Moe, Larry, Curly and Shemp at their finest! A full-length musical feature film starring The Three Sooges. It's Moe, Larry and Curly trying to help singing Carol Lawrence make ends meet. She's trying to break it big and her dishwasher friends (The Stooges) lend assistance and laughs. Bonus: Rare 1949 pilot film of Stooges! Stars Sydney Greenstreet, Peter Lorre and Geraldine Fitzgerald. Three strangers gather before an ancient statue and wish for riches. When it comes true, you wonder if it was supernatural or coincidence. The money leads down a dark trail of revenge. A chilling mystery in more ways than one! Kerwin Matthews (from THE SEVENTH VOYAGE OF SINBAD) plays Dr. Gulliver, whi finds wild adventure when heading for th Indies! This is part of th Ray Harryhausen Collection with stunning special ffects. Lightweight cardboard packaging. Two films and a cartoon! BLUEBEARD (1944) John Carradine is great as the murdering artist/puppet-maker. HOUSE ON HAUNTED HILL (1958) Spend a night in a haunted house. Plus, Superman cartoon THE MECHANICAL MONSTERS. The fondly remembered mysery and horror TV series that was hosted (and frequently starred) Boris Karloff. All 67 hour episodes on 14 DVDs with loads of extras. A massive collection to keep you "thrilled" for weeks, and months! A sleazy, rotten guy (Tod Slaughter), is after a young pretty woman. He's stark raving mad, laughing hysterically with glee and evil. In the first 5 minutes Slaughter's strangled one guy and clubbed to death another. Within 10 minutes he's drooling a young woman who's wearing a low-cut dress. Lions, gorillas, quicksand and Universal's best music cues are found throughout the jungle action! A 12-Chapter serial. CLICK IMAGE FOR MORE. Pure science fiction fun. It was a great story by H.G. Wells and it's a great movie too! A young inventor invents a time machine a travels backwards and forwards in time. Finally getting stranded in the distant future where things are quite different. From producer George Pal. A really interesting collection of hard-to-find "time warp" movies. Four feature films in this two disc set. CLICK IMAGE FOR TITLES AND MORE. The first fifteen episodes of this classic TV sci-fi series are all here on this four DVD set. CLICK IMAGE FOR TITLES AND MORE. The second season episodes of this classic TV sci-fi series are all here on this four DVD set. CLICK IMAGE FOR TITLES AND MORE. Vincent Price is giving it his all, making the unbelievable, believable. A creature that looks like a giant centipede grows in people's backs when they are frightened. CLICK IMAGE FOR MORE (If you can take it!). Foreign spies are after a "Space Robot" being developed by an American scientist working out side government regulation. he robot is to be controlled by mental telepathy and perhaps the robot himself is developing emotions. A young boy and robots....it's a slice of 1950's sci-fi apple pie! An amazing unaired pilot TV show featuring the robot TOBOR THE ROBOT. It was shot on film in the mid fifties and never made it to TV! CLICK IMAGE FOR DETAILS. TOD SLAUGHTER TRIPLE FEATURE - MURDERS IN THE RED BARN/CRIMES AT THE DARK HOUSE and THE DEMON BARBER OF FLEET STREET (1930s British Horror). CLICK IMAGE FOR MORE. Stars Russ Tamblyn, Alan Young, June Thorburn and Peter Sellers. The classic childhood story brought to life by producer George Pal. Toys are breathed life by stop-motion animation and the effects are still stunning. Humorous, adventurous and magical. Midnite Movies Double Feature: TOMB OF LIGEIA (1964) and AN EVENING OF EDGAR ALLAN POE (1970). CLICK IMAGE FOR DETAILS. Stars Ken Maynard, Cecelia Parker and Lafe McKee. A masked phantom killer is on the loose in a western town. Cool make-up for a western at the climatic unmasking scene. Stars Chester Morris. A diabolical killer called "Mr. Ace" s murdering everybody! He leaves his calling card of the Black Ace of Spades just before each victims untimely demise. A fforgotten weird mystery from the 1930s. CLICK IMAGE FOR MORE. Leo G. Carroll stars as a man aided and tormented by happy-go-lucky ghosts. Classic TV fantasy-comedy. Multiple episodes. Stars Roland Young, Joan Blondell, Billie Burke, Patsy Kelly, Carole Landis and George Zucco. Blondell is murdered by a cloaked phantom in a castle. CLICK IMAGE FOR DETAILS. Weird ghost story with Richard Calson as a psycho-boyfriend who just gets fed up and offs his girlfriend. She's not happy about it and haunts him. Some outrageous visions including him holding her screaming head as it curses him. Weird ghost story with Richard Calson as a psycho-boyfriend who just gets fed up and offs his girlfriend. She's not happy about it and haunts him. Some outrageous visions including him holding her screaming head as it curses him. Restored Classics Series from The Film Detective. Weird ghost story with Richard Carlson as a psycho-boyfriend who just gets fed up and offs his girlfriend. She's not happy about it and haunts him. Some outrageous visions including him holding her screaming head as it curses him. This is the nice print direct from the Warner Brothers vault! Christopher Lee is an undead Baron who uses Edgar Allen Poe devices of torture in his castle on some travelers. Otherworldly and down right weird. The thing that everyone remembers is the forest with bodies hanging from all the gnarled trees! Stars Burgess Meredith, Jack Palance, Beverly Adams, Peter Cushing and Michael Ripper. A series a short stories are framed around a sideshow carnival as Diablo tells the future of some sceptics. CLICK IMAGE FOR MORE. Mad scientist tries to cure criminals in a mad lab on a mad ship! Stars Lyle Talbot and Irving Pichel (MURDER BY THE CLOCK, DRACULA'S DAUGHTER). Directed by Victor Halperin (WHITE ZOMBIE). Low budget, atmospheric. Stars Charton Heston, Janet Leigh, Orson Welles, Akim Tamiroff, Zsa Zsa Gabor and Marlene Dietrich. A corrupt border town police chief frames a young man. CLICK IMAGE FOR DETAILS. Karloff, Rathbone and Price in this ancient tale of rivalry. Karloff is awesome as Mord the Torturer. TOWER OF LONDON (1939) and more on the THE BORIS KARLOFF COLLECTION (1937-1952). CLICK IMAGE FOR DETAILS. A nostalgic look back at the greatest toy commercial from the 1950s and 1960s. You'll see young actors like Billy Mumy (LOST IN SPACE), Kurt Russell, Shari Lewis and others. Plus, all those great toys we grew up with. Scores of TV commercials that will take you back to yesterday. Killer Creature Double Feature: TRACK OF THE VAMPIRE (1966) stars William Campbell and NIGHTMARE CASTLE (1965) starring Barbara Steele. Presented like a night at the drive-in with intermission, cartoon and other extras. Out-of-print. Join the world's foremost experts on Dracula as they explore the untold story of the Transylvanian Count, from the novel through its landmark stage productions and classic movies. Interviews: Bela Lugosi, John Carradine and Christopher Lee. Plus over 90 minutes of Dracula movie trailers! TRAILERS: FANTASTY FILMS (Trailer Collection). CLICK IMAGE FOR MORE. A huge collectuion of movie preview trailers from the 1950s-1960s. A great collection to have rolling during your next "monster movie night" at home. CLICK IMAGE FOR MORE. Classic Universal and other horror trailer-previews from the 1930s and 1940s! CLICK IMAGE FOR MORE. TRAILERS: HORROR VOL. 1 (Trailer Collection). CLICK IMAGE FOR DETAILS. TRAILERS: SCIENCE FICTION VOL. 1 (Trailer Collection). CLICK IMAGE FOR DETAILS. TRAILERS: SCIENCE FICTION VOL. 2 (Trailer Collection). CLICK IMAGE FOR DETAILS. OUTSIDE THE LAW (1920) Lon Chaney in the underworld. THE TRAP (1922) Lon Chaney is a prospector who's mining business, and his girl are stolen by an evil rival (Alan Hale). CLICK IMAGE FOR DETAILS. A Film Noir suspense thriller with Lloyd Bridges playing a counterfeiter that is running from the law and a group of evil killers. A situation that plays like an Alfred Hitchcock film in the shadows of the law. Co-stars Barbara Payton. Stars Mary Astor, Lyle Talbot, Nat Pendleton and Joyce Compton. A private scientist working on a new television machine is hodwinked by some gangsters. Very dated sci-fi, but a fun period piece. Hey any movie with Nat Pendleton in it is okay by me! Stars Lynn Bari, John Conte and Lorri Richards. A moody dark mystery of a isolated family estate and a psychotic murderer at large. A real rarity in the tradition of DEMENTIA 13. TRIO OF TERROR: NOSFERATU (1922), NIGHT OF THE LIVING DEAD (1968) and HOUSE ON HAUNTED HILL (1958) - (Triple Feature). CLICK IMAGE FOR DETAILS. Stars Arthur Wontner, Ian Fleming and Lyn Harding. Arthur Wontner as Holmes appeared prior to Basil Rathbone as the detective in five British productions. CLICK IMAGE FOR DETAILS. Stars Joan Crawford, Michael Gough and Benard Kay. A Herman Cohen production in which a missing link is discovered! An actual half-man, half-ape: a troglodyte! CLICK IMAGE FOR DETAILS. Directed by Alfred Hitchcock. Starring Edmund Gwenn (THE WALKING DEAD, MIRACLE ON 34th STREET), John Forsythe and Shirley MacLaine. One of the quirkiest Hitchcock films tainted with horror and loaded with dark humor. CLICK IMAGE FOR DETAILS. The classic Henry James novella about a governess watching after two children. The children seem to be possesed by long dead people who had an affair in the house. Dan Curtis directed this version which stars Lynn Redgrave. Three episodes from the Flash Gordon TV Show: Akim the Terrible, The Breath of Death and The Race Against Time. Plus, three episodes of the original One Step Beyond! Stars Ken Clark, Michi Kobi, Tom Conway and John Wengraf. Beautifully photographed, this space travel sci-fi has twelve scientists rocketed to the moon. They discover signs of life on the moon...that warn then to get out, while the getting's good. TWENTY MILLION MILES TO EARTH - 50th Anniversary Edition (1957) - Restored B/W and Newly colorized version! CLICK IMAGE FOR DETAILS. 20 MILLION MILES TO EARTH and MUCH MORE - THE RAY HARRYHAUSEN LIMITED GIFT SET (Three DVD movies and Ymir Monster Action Figure). CLICK IMAGE FOR DETAILS. Starring James Mason, Kirk Douglas and Peter Lorre. The classic Disney Science Fiction film based on Jules Verne's novel. CLICK IMAHE FOR DETAILS. Three of Nathaniel Hawthorne's supernatural melodramas anthologized with Vincent Price starring in each. Sebastian Cabot stars along with Price in a creepy tale of immortality and resurrection. A more supernatural version of HOUSE OF SEVEN GABLES. Co-stars: Richard Denning and Beverly Garland! Weird spin on the ISLE OF LOST SOULS. John Ashley is washed ashore an uncharted island. He finds a Dr. Gordon residing there (jus' like Dr. Moreau!). Gordon is making a new race of people...you guessed, from animals. Fanged werewolf types, a panther woman (natch!) and loads of other manimals! The landmark TV series with twist endings, thoughtful stories, great acting, scares and irony. All 156 episodes of Rod Serling's classic television series in one special box set. This collection includes all 5 seasons. Stars include Art Carney, Burgess Meredith, Leonard Nimoy and more. 25 discs! Two Mexican spooky comedies with the comedy team of Tin Tan and "El Loco" Valdez. These movies are in Spanish with no subtitles. James Arness (THE THING) stars as Captain Hamilton. An all-business, tough-as-nails leader who shipwrecks on an island populated by monsters from the beginning of time. Dinosaurs, mammoths and menace face the ship-wrecked crew! Stars Connie Stevens, Dean Jones and Cesar Romero. A young woman must spend the night in her estranged father's house after his death to receive the inheritance. Now the house is rumored to be haunted and is rigged with magician's tricks.